Most often found attending an inner hive-cluster, the queen is a highly-intelligent breed which helps to coordinate and defend the hatchery. They can psionically supercharge the regeneration of other Zerg, expending their own energy to heal them. 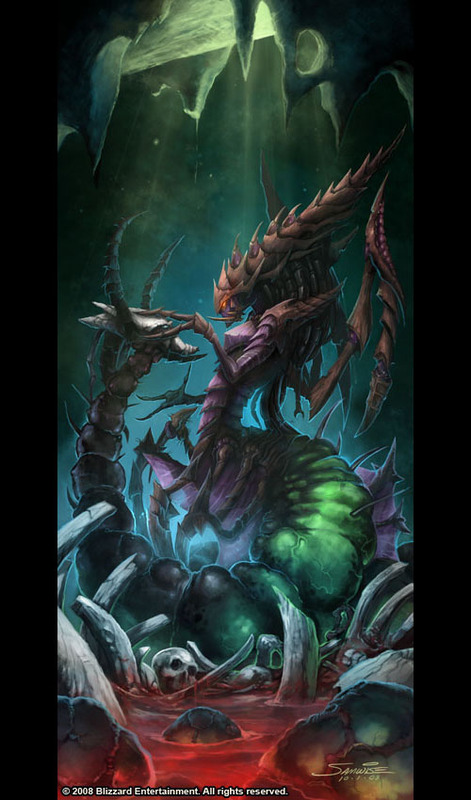 Advanced hive queens called Brood Mothers are the leaders of large Zerg swarms, developing superior intelligence and brilliant leadership and stratagem – and sometimes, even psi abilities. Traits: Zerg; Enhanced Move 1 (Ground; Accessibility: Only on Zerg Creep); Extra Legs (4); Healing (Psionic; Accessibility: Only on Zerg Creep; Zerg only). • “Brood Mother” – IQ 18; Intelligence Analysis-18; Leadership-18; Strategy-18; Tactics-18. • May learn Expert Skill (Psionics)-18, and psionic abilities.